2 pages.8 x 10 1/2 inches.Opens out to 16 x 10 1/2 inches.A nice line drawing of the Ace with specifications on the back. 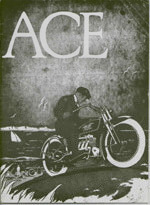 16 pages.8 x 11 inches.Tells about the Ace and all its improvements.Gives specifications and has a nice center page illustration. 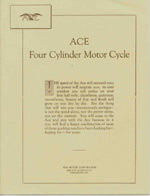 3 1/4 x 9 inches that folds out to 11 x 9 inches.Lists 18 improvements for the Ace of 1927.